Sweet! Everybody loves cupcakes! Your little girl & her doll will LOVE wearing matching T-shirts saying just that! 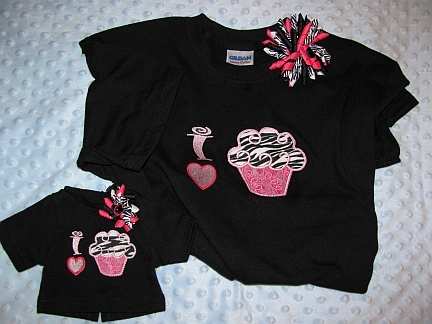 T-shirts available in black with a cool, appliqued zebra cupcake in sizes Youth Small-Extra-Large. Matching korker bows ship free when ordered with the shirts!